Frontier farms were family farms, and the family was an economic as well as a social unit. Though most pioneers believed the woman’s sphere was within the home, the shortage of manpower meant many women (and children) helped with the farm. They helped dig cellars, build cabins, plow, plant, and harvest, as well as tend to their “domestic” activities, such as cleaning, cooking, sewing, and caring for the children. To understand the lives of frontier Christian women, then, we must take a look at the toil that filled their days. Men and boys helped gather fuel for the fire and keep the wood box filled. On the treeless plains they collected dried buffalo chips in sacks and kept them for use as fuel for cooking as well as for warm fires in winter. Cornbread and corn mush were standard fare in the beginning, but food usually became abundant as the family farm thrived. Gardens and orchards produced vegetables and fruits that women canned or dried for use in the winter. Several times a week, women baked bread. If the family had a good cow, butter was made every other day, both for family use and to be sold in town for extra money. "Mother was asked to bake a cake for the affair. In consequence, we ate bread without butter for several days in order that father might have enough to take to the store and exchange for the amount of sugar necessary to make a cake. This he did, covering 16 miles on horseback. Mother’s was the only cake at this important gathering, and despite the fact that she had no recipe to go by, that she used sour milk and soda in the making, it was pronounced by those who partook as being all a bride’s cake should be!" Frontier women were also responsible for the family’s clothing. Many families raised sheep for wool, which the women washed and the children carded for spinning. The wool was dyed with natural dyes walnut bark for brown, osage bark for yellow, cochineal bugs for red. After spinning the yarn, women knitted socks, scarves, and sweaters. Clothing was simple and sewn at home. Fabrics such as calico and muslin had to be bought at stores, and some fabrics were recycled: flour sacks, for example, were often made into underwear. For good stewardship, as well as necessity, clothes were repeatedly patched or re-sewn and given as hand-me-downs. Scraps of fabric were used in quilts with designs whose names often reflected the frontier lifeturkey tracks, bear claw, butter churn, log cabin, wild goose chase. Sometimes the quilt’s name referred to political issues54 40’ or Fight, Bleeding Kansas, Texas Star. Still other designs proclaimed Christian themes—the Delectable Mountains (from John Bunyan’s Pilgrim’s Progress), Jacob’s Ladder, Cross and Crown. On the frontier, where schools were often unavailable, both parents, but especially the women, homeschooled their children in the basics of reading, writing, and arithmetic. Training in the Christian faith was also important. Rebecca Ebey, a pioneer from Virginia, wrote, “We...spend our time in training the young minds of our children in the principles of Christ and creating within them a thirst for moral knowledge.” The Bible and Pilgrim’s Progress became the primary textbooks for many. 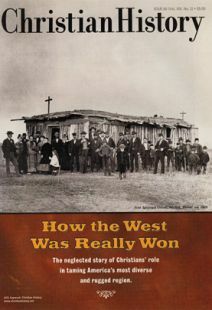 Teachers on the frontier were very often sent out by eastern missionary agencies, and when schools were established, they also inculcated a Christian moral education. But most of the Christian education and character development took place in the faithful day-to-day fulfillment of farm responsibilities. One of a child’s earliest chores was feeding the chickens. Later the child might be given a calf to care for. Parents expected their children to develop habits of industry and hard work, not just for the building of Christian character but for the family’s very survival. Diana Lynn Severance is the author of Deep Roots, Strong Branches, a history of the Klein family in Texas, and is a member of the Christian History advisory board. John and Ida Klein lived in Texas in the late 1800s. They faithfully attended Salem Lutheran Church for years (often traveling Saturday evenings to make sure they were in time for the Sunday service), but their religion was hardly confined to Sundays. Family devotions were held daily, blessings were said before meals, and a prayer of thanksgiving after meals.